Sorry, no fancy picture this week. I honestly just don't have the energy!! 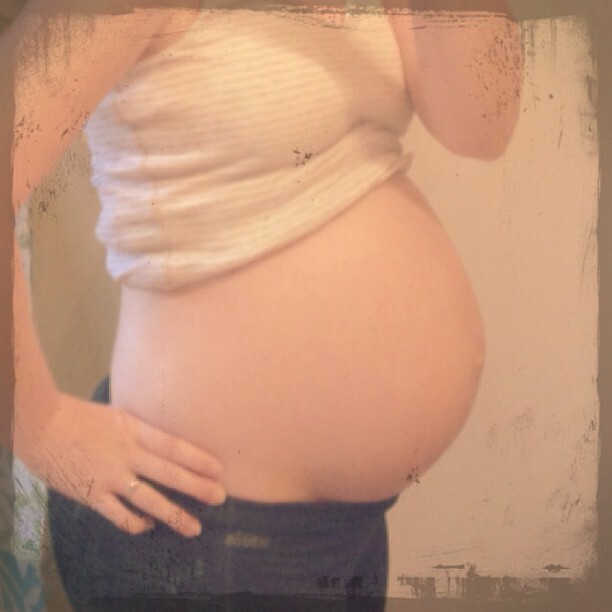 Instead, I'll again share this quick one taken at 31 weeks, 5 days...close enough anyway right? They did not do any measurements during our ultrasound Friday night, so we're not yet sure on her exact size, but the ultrasound tech did make a comment about being able to see facial features really well because baby was big and mommy was small...I don't know if she meant that baby was typical size for 32 weeks, but I'm still just small, or if we're looking at having a big baby...this mommy is a little worried! Hoping we will find out for sure very soon! Maternity clothes: Probably 95% maternity at this point. I could still wear many of my pre-pregnancy tops if I chose to, but they're getting shorter than I would prefer!! Best moment this week: Seeing our baby girls sweet face! We got a really great look at her facial features, which was really neat. 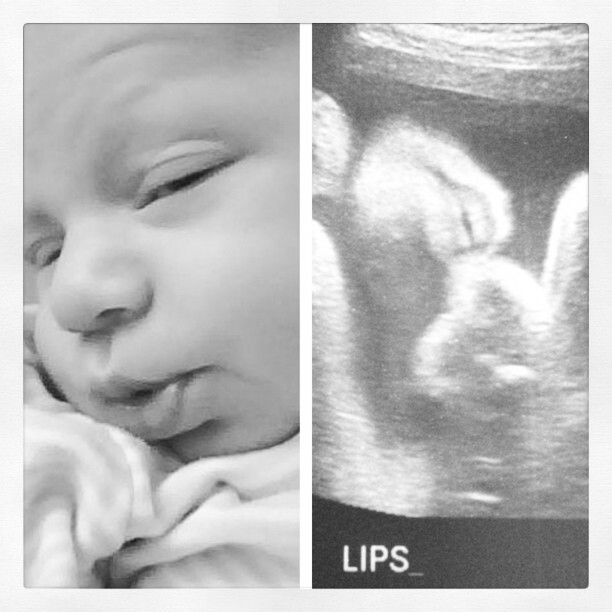 We even got a picture of her adorable little lips...I think she's going to have full pouty lips just like big brother!! What do you think? Shaun at a few weeks old. This was also the first ultrasound for Finley that Daddy had been there for, so it was very special for him too! He could not get over how clearly we could see her face, truly amazing! Movement: Still all the time! Food aversions: Still most drinks...I've had the occasional Sprite that hasn't bothered me TOO much, but can't stomach the thought of anything but water for the most part. Labor signs: See above. But still only a fingertip dilated, so that's good! Sleep: Not going so well...I miss it! Symptoms: Back pain. Contractions. Swelling. Heartburn. Anemia. General exhaustion. Forgetfulness. You know, pretty much all those great things that can be expected in the third trimester!! Belly button in or out? Flat-ish. Looking forward to? Baby shower (assuming we don't have to cancel, it's in 2 weeks and 3 hours away...all things considered we're not entirely certain the doctor will advise us to go). Next appointment on Tuesday, so we can find out for sure and hopefully get the next ultrasound scheduled. Finishing up getting everything done...mostly, we have everything ready at this point...just a few things to finish. Big brother's reaction to meeting sister for the first time. This makes me excited for the third trimester, even though I just entered the second trimester. It seems to be going a lot quicker the second time around! i wish I had kept up with details like this during my pregnancy this is so sweet.